← Are equity markets in bubble territory? Will it be different for Level3 this time? As per my previous post on telecom experiences, I reviewed my projections and valuation methodology for Level3. Level3 has a frustrating yet fascinating past. It miraculously survived the telecom implosion with an over sized debt load through growing into its debt by buying up smaller metro focused telecoms and its most recent merger with a post chapter 11 Global Crossing. Level 3 struggled with the integration of its numerous merger partners from 2005 to 2007 and, with the downturn in 2008 to 2010, suffered reductions in the both of the top and bottom lines of the combined entities. There is however now some hope that the integration with Global Crossing will not suffer the same fate. For a start, Level3 approached the integration with a much sharper focus on the customer experience during the merger and ensuring minimal service disruptions. Also, Global Crossing itself had a number of years following its restructuring where it focused on its core products and de-emphasised the low margin commodity business. Finally, the recent replacement of long time CEO Jim Crowe with the COO Jeff Storey seems to have brought a new focus in the company on growing the larger business organically rather than through continuous M&A. 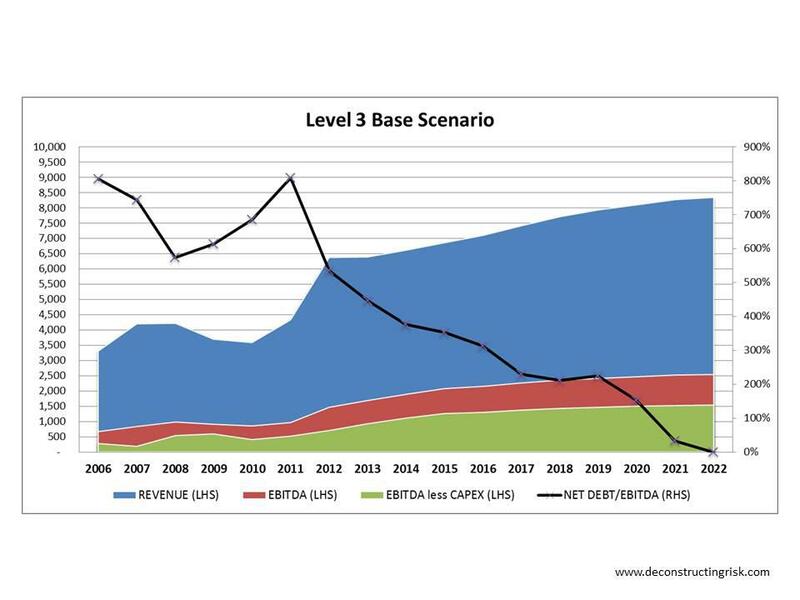 I developed 3 scenarios to illustrate the benefits and the dangers of the current Level3 leveraged business model. 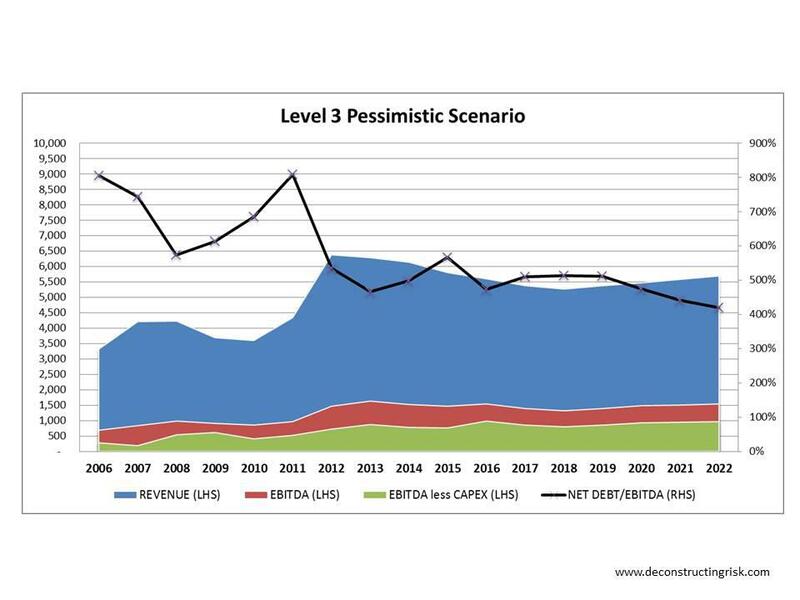 The pessimistic scenario assumes that Level3 does not succeed in growing the top line and stumbles on achieving material ebitda margin improvement, only managing margins in the middle 20’s range. 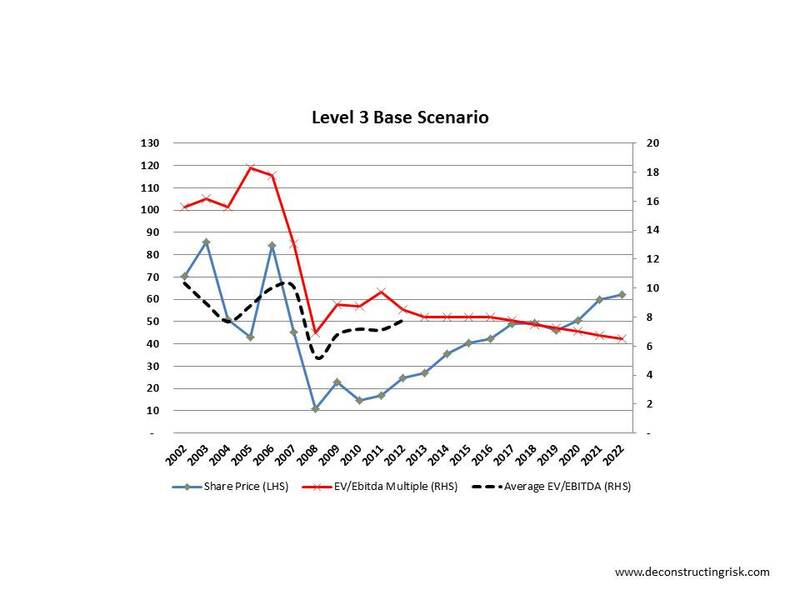 The base scenario assumes that Level3 does grow its higher margin business modestly (against a stodgy economic background with interest rates gradually stepping up over the medium term) which offsets reductions in voice based business, achieving an ebitda margin around 30% in the medium term. The optimistic scenario assumes Level3 gets on-going synergies and material ebitda margin improvement achieving a 33% margin by 2017 and thereafter. 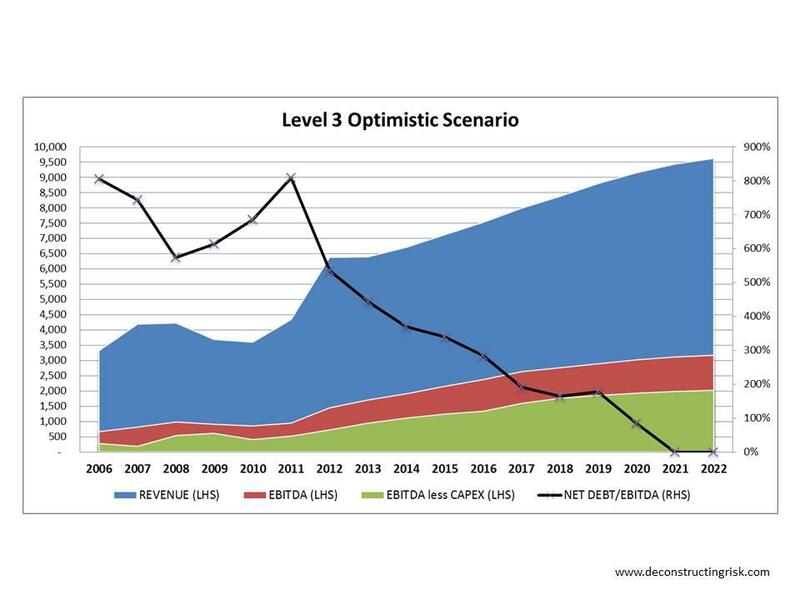 Graphs representing the scenarios are below and also show the resulting leverage ratios the business achieves. 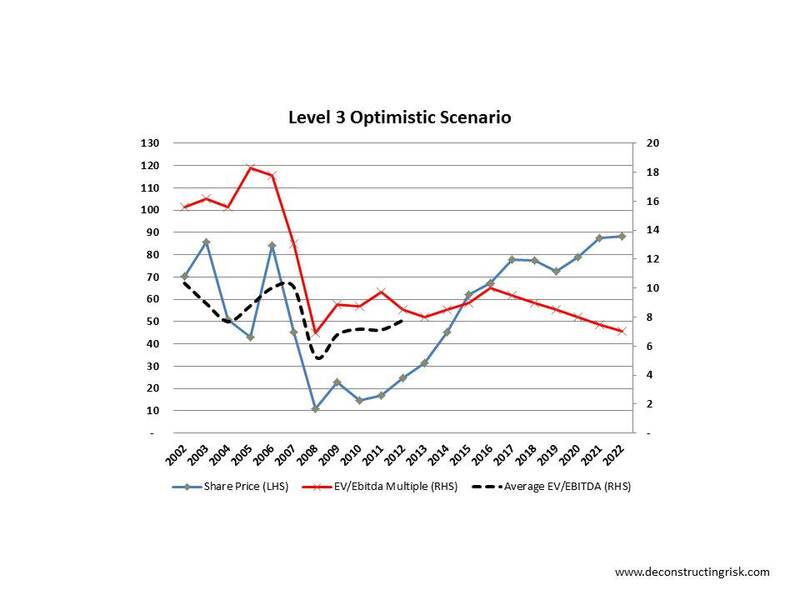 The pessimistic scenario assumes that Level3 can’t get its leverage materially below 500% and would ultimately need to be restructured. Assuming the equity would be wiped out here may be conservative given the equity’s history to date at higher leverage levels. Also, a takeover may give the equity some value in this scenario. 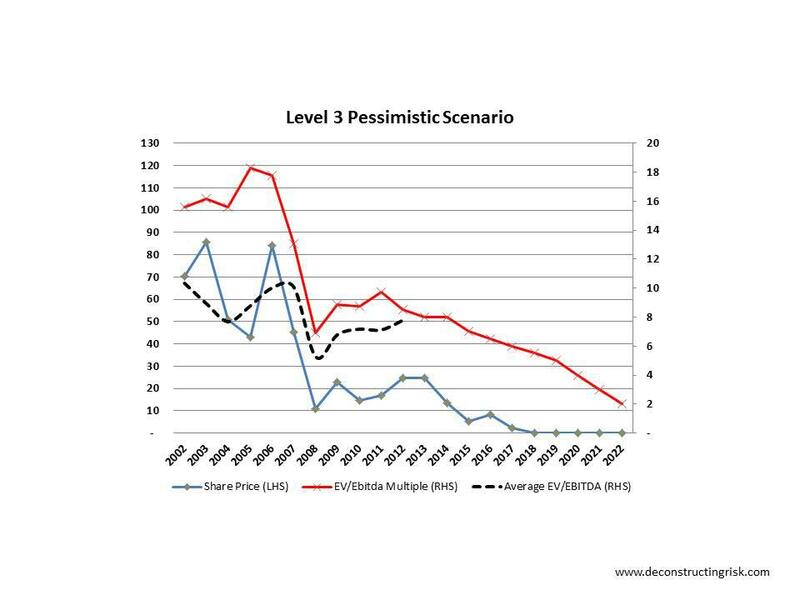 Notwithstanding these possibilities, the pessimistic scenario does illustrate the dangers to investing in a highly leveraged firm and given the current macro-economic headwinds and the likely higher interest rate environment to come, I believe an equity wipe-out remains a risk for Level3 in a pessimistic scenario. The thin line between madness and sanity for highly leveraged firms is illustrated by the upside that modest and healthy growth of both bottom and top lines could result in the base and optimistic scenarios respectively. 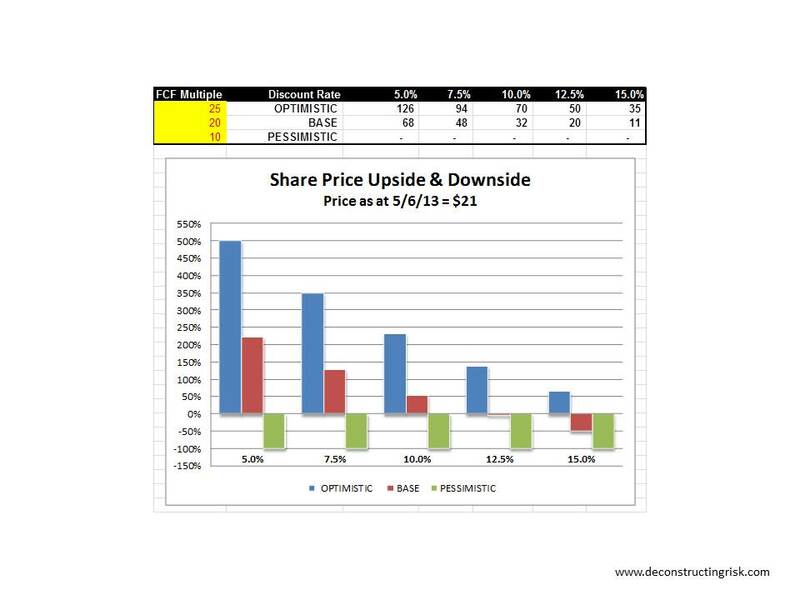 The following table shows the DCF results at discount rates ranging from 5% to 15%. The discounted cash-flow analysis assumes a termination multiple of discounted free cash-flow after 10 years in 2022 (different multiples for each scenario). As I stated in the previous telecom post, I take the results of a DCF analysis for these firms with a healthy pinch of salt given the timeframe involved and the number of assumptions that have to be made (e.g. cost of debt). Focussing on a discount rate of between 7.5% and 12.5% (which is where I think LVLT should be) does show that the leveraged business model of Level3 provides a 2 to 3 times upside against a 100% downside risk profile (assuming a current $21 per share price). An alternative valuation method is to look at the EV/EBITDA multiple valuation that the scenarios above may imply. This analysis confirms a possible 200% to 300% upside for the base and optimistic scenarios respectively over a 5 year time horizon (and the 100% downside!). Level3 has broken many hearts in the past. However, if the new CEO can execute on organic growth and margin improvement, the stock offers an attractive upside over the next few years due to its leveraged balance sheet and operating model. A lack of macro-economic turmoil will also be an important factor in any success. For even more aggressive investors, playing the stock through long dated out of the money options offers the prospect of leveraging returns even further (with the accompanying increase in risk profile). As I keep stating, Level3 has promised much in the past and failed to deliver on a spectacular basis. This time, maybe, just maybe, it could deliver something for patient investors. Anybody considering Level3 should always keep in mind that it remains a high risk/return play and is not for the faint hearted. This entry was posted in Investing Ideas, Telecom and tagged discounted cashflow telecom, EV/EBITDA multiple telecom, high debt telecom, Level 3, leveraged equity, options Level 3, telecom investments, telecom valuations, valuation Level 3. Bookmark the permalink.